When the big reveal dropped for Call of Duty: Black Ops 4, I was excited to see that little bit of technology make its way back into the franchise. Now I’m not saying that I missed the boost jumps or wall running in Call of Duty: WWII, but rather the simple slides and quicker pace of gameplay. With that said, I, like many others in the Call of Duty fanbase, was worried that BO4 was maybe a bit too similar to its previous iteration in Black Ops 3. After playing this first weekend of the beta, I’m confident that the two don’t feel all that similar at all. Sure, it’s still a Call of Duty title from Treyarch, and it definitely shares some of the same formula, but all in all, there’s a lot of changes that make it just plain fun. With that said, no beta is really a beta without some kinks that need to be worked out before the games full release. So, with the first weekend of the Black Ops 4 beta firmly in our rearview, now is the perfect time to talk about the ups, and the downs of the entire experience. Though Black Ops 4 may look, at first glance, like a reskinned version of Black Ops 3 sans the wall running and boost jumping, this latest Call of Duty game plays entirely different than all those before it. Sure, it still has a familiar franchise feel, but this time around it’s colourful, fresh, and exciting. BO4 is full of fast-paced action and it’s good to see that Treyarch has made some serious changes to the pick ten class system, with new equipment slots for specialist abilities, new twists on weapon attachments, as well as some seriously awesome changes to the specialists. Both the returning specialists from Black Ops 3, and the brand new specialists feel exciting to play and that’s a damn good thing. Black Ops 4 has given players a lot more freedom to take advantage of their very different play styles, and I’ve never had so much fun experimenting with different class setups, specialists, and gameplay as I did while playing the beta. This might seem like a weird point to make for a game like Call of Duty, but it’s an important one for Black Ops 4. Treyarch has revamped the entire pick ten system, rearranged the weapon classes, and added gear slots for each specialist. In making all of these changes Treyarch has made it impossible not to think about what kind of style you’d like to adopt while playing the game. To a certain degree that choice has always been present within previous COD titles in the form of whether you’re going to play with more or less perks, more or less weapons attachments, with or without grenades, with or without a secondary weapon etc. This time around however you have all of those decisions to make and more. 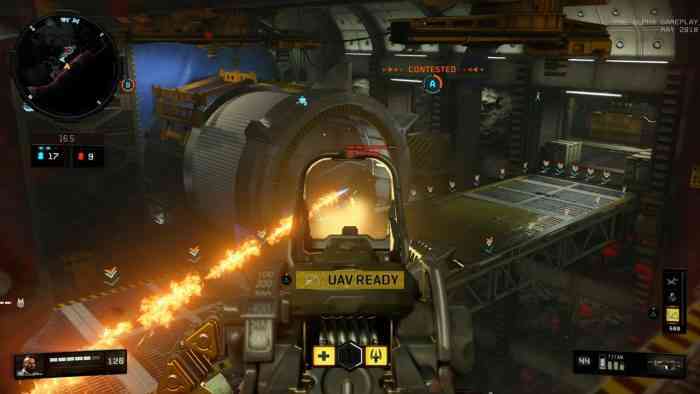 Black Ops 4 offers mods for maxed weapons, various attachments that require the first part to be equipped before using the second (eg. long barrel one and two), as well as the most important decisions of all: which specialist and which gear? Each specialist comes with very unique abilities which will either help the entire team, or solely help you, allowing players to have a bit more freedom. These specialists, as well as the gear slots, also require you to choose between play styles. Will you decide to play with the stem shot which will heal you after taking damage or will you decide to equip more armor? Will you play with the COMSEC device which makes it way easier to call in scorestreaks or will you play with the acoustic sensor which allows you to see and hear enemy movements easier? Whichever you decide could mean the difference between life and death, winning or losing, and that not only increases the stakes but, makes every match even more exciting. Treyarch has come out of the gates swinging with this Black Ops 4 beta complete with five playable maps, ten specialists, six different game modes, including their new one control, a ton of weapons, equipment, and scorestreaks. As you can imagine, having lots of content to play around with and get excited about is definitely a huge selling point for the full game. While the weapons and scorestreaks will likely unlock in a different order, it’s fun to get a feel for each of the ones available right now. Plus, all the content allows for a lot of experimentation with class setup and specialists which should get you back into the swing of playing Call of Duty in a near future setting.